Edmond grew up in the automobile industry. 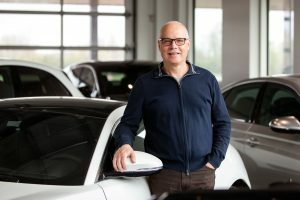 His father opened a VW franchisee in 1952 in the Niagara region, subsequently adding Audi and Porsche franchises, which the family operated for 36 years. Edmond chose to pursue a career in Design and Technology innovation and holds numerous patents; however automobiles remained his passion leading to the launch of DreamFleet in 2006 and subsequently TruCondition in 2017. He has a Bachelor of Industrial Design from Carleton University, an MBA from the Molson School of Business in Montreal and speaks Hungarian. He has four adult children, enjoys the outdoors and cottage life. Jill began her professional career as a business consultant in Ottawa’s IT Industry. After several years, the entrepreneurial bug bit and she channeled her creative energies into a wedding and portrait photography business, that she operated successfully for ten years. She is excited to apply her business acumen and quality service experience into this new Automotive chapter. Jill learned to drive on a manual transmission, and still prefers to drive a stick today. She graduated from Carleton University with a BA in Sociology. Jill lives in Almonte with her two beautiful daughters, husband, and Vizsla puppy, Clover; and loves spending time at her family cottage.